Not enough albums open with the majestic rasp of a harmonica. 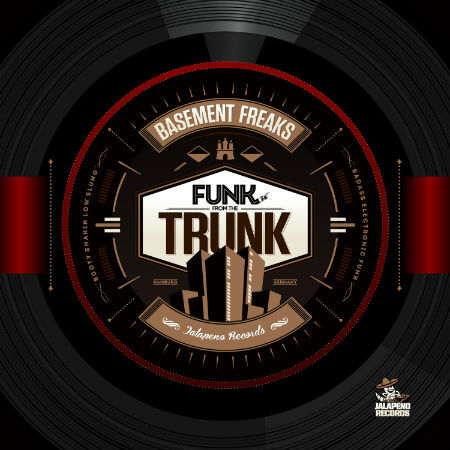 Basement Freaks attempt to redress the balance with their second studio album “Funk From The Trunk” which shows the boys in full P-Funk flow. From opening track “A Blues Thang” to the last gasp of album closer “The Last Train” – you know you are listening to young soul rebels who have found their full funky flow. Producer George Fotiadis won a lot of fans as a leader of the burgeoning ghetto funk scene and while that scene is still big internationally, there are no wobble bass lines here, just block rocking hip hop beats, funky wah wah guitars and funky as flip vocals from longtime collaborator and fellow Freak Georges Perin as well as guest spots from Mustafa Akbar of Nappy Riddem, Charlie Funk and MC Rayna. Opener “A Blues Thang” was the standout track from a vinyl sampler EP released by the Freaks at the end of last year and is distinctive for its deep south harmonica lead and blues drenched vocal. Which part of America’s deep south are these boys from you ask ? Thessaloniki I answer. Greece is the word. Moving on to the guests – Mustafa Akbar is a mic killer who first came to our notice here at Jalapeno Towers providing the funk for our DC Brothers Fort Knox Five. So Basement Freaks reached out to him to work with them on this album. Mustafa liked the flavour of their funk and sealed another international connection providing a special flavour to the album and bringing the DC love to 3 tracks. “Work It Out” featuring MC Rayna is a big heavy hitting slice of hip hop and street soul. The aggressive twang of MC Rayna gives the track an edge that will have clubs jumping from Atlanta to Hamburg where the Freaks are now resident. The Moondoo club in Hamburg is an important melting pot for artists who can bring the heat and it was here that the Freaks met Charlie Funk who plays regularly at the club. A night in the studio later and “Funk For Freaks” was finished and it was down to the Freaks to mix and master their second album for Jalapeno. “Funk From the Trunk” is a step on from “Something Freaky” – their debut. That album spawned a hit single which was licensed to a US TV show further upping the Freaks credibility over in Hollywood. Their debut album charted in the US college radio charts and Basement Freaks are looking to build on that success this time round.